A podcast about all things Macintosh. For Mac geeks, by Mac geeks. 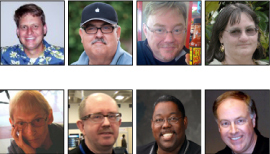 Show 343. iOS 5 release moved to Fall. WWDC sells out in hours. International ipad2 launch. iOS 4.3.1 update. New iMacs soon? Mac 10.6.7 OpenType font bug. iPad 2 glass stronger. Lion Developer Preview 2. Voice Control on the Mac. Offline Mail in iOS. Gmail, Mail.app, and iOS set-up. Backward compatibility and upgrading. Shifting media to apps. Duplicate podcasts in iTunes. News feeds and the paywall. A podcast about all things Macintosh. For Mac geeks, by Mac geeks. Episode 075. The Activity Monitor built in to OS X can provide a ton of great information on what is going on inside your Mac. Trouble is, this is only useful if you know what you’re looking at. I wanted to better understand this incredibly useful utility so for this show I dive deep into Activity Monitor and share what I find. A podcast about all things Macintosh. For Mac geeks, by Mac geeks. Episode 074. In iTunes 9 Apple added a feature called Home Sharing. Slowly they have been expanding on and improving the feature and with iOS 4.3 they brought it to our iDevices. By sprinkling in integration with other technologies, like Air Play, Home Sharing has been getting more and more useful. Due to the improvements I’ve noticed it slowly integrating more tightly into my iLife. In this episode I look at this new feature, how I’m using it, and share some tips and tricks you may have missed. I was doing some testing of the camera in the new iPad 2 and had this strange artifact start showing up on the sensor. It seems to be triggered by bright white points. I’m not sure at the moment if it is a defect or simply a shortcoming of the low end camera sensor Apple is using in the iPad 2. I get the effect in both video and stills. If you are experiencing similar issues or are a smart camera sensor engineer and know what’s causing this, please post in the comments or shoot an email my way (maccast at gmail dot com). You can catch me on the latest MacJury podcast (iTunes) chatting about the iPad 2 with judge Chuck Joiner and a gallery of Mac pundits. The panel included Chuck, Victor Cajiao, Jeff Gamet, Pat Fauquet, Nancy Gravley, Don McAllister, Terry White and myself and we discussed our buying experiences and early impressions of the new device. A podcast about all things Macintosh. For Mac geeks, by Mac geeks. Episode 073. I picked up the new iPad 2 on Friday and spent the weekend putting it through it’s paces. In this episode I share my first reactions to the new device and offer my opinion on I think it’s worth the upgrade. Here’s some Sunday geekery for you in the form of my iPad 2 unboxing video and images. You can find more photos on the Maccast Flickr page or on the Facebook Page. I have an update to bring you on yesterday’s post about a tent showing up outside the temporary location of the Knox Street Apple Store in Dallas, Texas. Thanks to some guest reporting by David Collins we have been able to confirm that the guy inside the tent is Justin Wagoner. 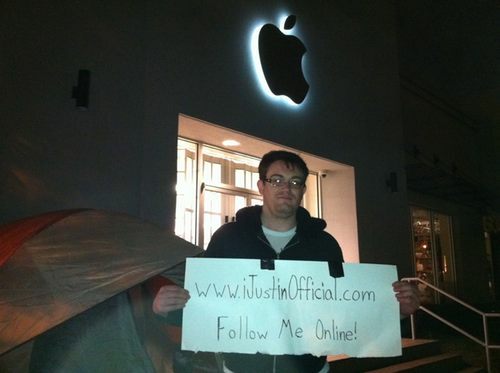 Justin has made a bit of a name for himself online by being first in line for several Apple launches. The one big question we had was “Why”? Justin simply said he was on spring break and it would be an adventure. He told us he expected lines to start forming sometime Wednesday and that he set up camp around 9:30 AM Sunday morning (3/6/2011). Another reason we’re guessing Justin is in line for this event is that he doesn’t own an original iPad. Last year when it was released he said he saw the iPad as a luxury accessory, so we asked him about his change of heart for this launch. Justin mentioned that the iPad was an unknown quantity and there just weren’t that many apps specifically designed for it. The iPad’s growing popularity, actually using one at the Apple Store on Knox Street, and the now over 65,000 apps seem to have changed his mind. Justin can now see a real case for the utility of an iPad. Despite his launch day enthusiasm for some Apple products, Justin is a bit more reserved for others. He did not buy the first generation iPhone until a few months after its release.